WAIST HIGH: The Future Is Unwritten. A documentary about the life of legendary rock musician Joe Strummer, most famous as the lead singer of The Clash, opened in the UK last week. 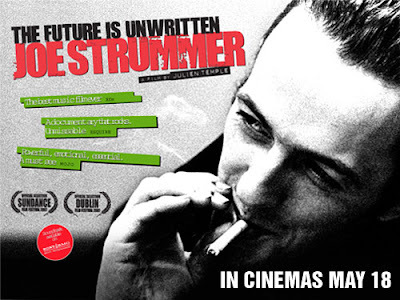 Directed by Julien Temple, The Future Is Unwritten combines previously unseen interviews with Strummer, who died in 2002, and frank conversations with those who were close to him. Temple said that while the musician had been alive, making a film about him was "the last thing I thought I'd do." But after Strummer's death, many of his friends had felt "lost" and the director realised that his life had not been properly celebrated. "I thought I could do a film, as that's what I do," explained Temple. As the front man of the Clash from 1977 onwards, Joe Strummer changed people's lives forever. (Five) years after his death, his influence reaches out around the world, more strongly now than ever before. In The Future Is Unwritten, Strummer is revealed not just as a legend or musician, but as a true communicator of our times. The Future Is Unwritten premiered at the 2007 Sundance Film Festival and was nominated for a Grand Jury Award.